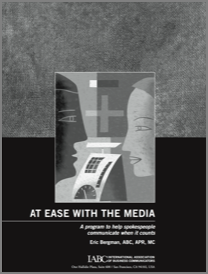 At Ease With the Media is a unique blend of online and in-person training that creates a learning experience for spokespeople—and a level of comfort for their advisors—that cannot be matched by any media training program on the market. Spokespeople learn to build better relationships with journalists by answering questions clearly and concisely. The result is an emphasis on transparency that leads to clear, accurate stories. Spokespeople learn to take advantage of opportunities to support business and communication objectives. They learn to manage the twists and turns that interviews often take. Above all, spokespeople learn to protect themselves and their organization at all times. They learn to stop talking. This reduces context and the likelihood of being quoted out of context. They gain insight into Eric’s proprietary defensive strategies, which have stood the test of time and enabled many clients to ethically extricate themselves from tight situations. If you’re interested in learning more about the most innovative, unique and effective media training program on the market, contact Eric. He’d love to put your spokespeople At Ease With the Media. “Media relations is something that I do in my job periodically. However, regardless of how infrequent it may be it is important to have an understanding of ALL of the elements of effective media relations. “As a media training program, At Ease With the Media does an excellent job of balancing these elements in a way that does not make you feel overwhelmed and allows you to come away with a much better sense of all of the aspects good media relations.